Michael Moore’s latest “Sicko” stunt to Cuba has seemed to land the controversial movie director in some hot water with the US Treasury Department. It appears that Michael Moore did not get permission to go to Cuba and may have violated the US trade embargo restricting travel to Cuba. Oops. But of course its a Right Wing conspiracy against Moore. Laws be damed. The Treasury Department’s Office of Foreign Assets Control notified Moore in a letter dated May 2 that it was conducting a civil investigation for possible violations of the U.S. trade embargo restricting travel to Cuba. A copy of the letter was obtained Tuesday by the AP. “This office has no record that a specific license was issued authorizing you to engage in travel-related transactions involving Cuba,” Dale Thompson, OFAC chief of general investigations and field operations, wrote in the letter to Moore. The letter noted that Moore applied Oct. 12, 2006, for permission to go to Cuba “but no determination had been made by OFAC.” Moore sought permission to travel there under a provision for full-time journalists, the letter said. Read the letter to Michael Moore from the Department of Treasury at The Smoking Gun. Of course Michael Moore is quick to have a response to his persecution by the Bush Administration. Funny thing that he could find no persecution of the Cuban people by Fidel Castro when he was in Cuba. 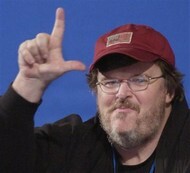 Michael Moore’s selective persecution, who’s the SICKO? Debbie Schlussel, Why Not Charlize Theron? Michael Moore’s “Sicko” Stunt … Who is the real Sicko? I can’t stand Michael Moore and his politically motivated and biased “documentaries.” I distinctly remember a scene in his previous film where he asks a US Congressman if the congressman has a son in the war and he answers no. Moore then criticizes the congressman for making a decision to vote for the war and not understanding that he is putting someone elses son or daughter in danger. However, Moore cut out a part of the congressman’s response that said he had a nephew serving in Iraq. How convenient. Moore’s manipulative and he will stop at nothing to prove his point, even if that means distorting facts or changing history. He broke the law by going to Cuba and now he want’s to blame the Bush administration for enforcing the law against him. Like Bush doesn’t have more to worry about than a Michael Moore documentary. Moore wishes he was that important. He is doing it for the money. His ability to peddle his conspiracy theory is something he learned from the grassy knoll movie. Those who buy into conspiracies usually lack the intelligence to see what is being peddled to them as fact and a fool and his money are soon parted. Moore is no fool. He is after the money. He made more than $100,000,000 on that piece of fiction he wrote post 911. It is ridiculous and a waste of taxpayer’s money – OFAC is trying to determine if Michael Moore, who won an Oscar for one of his documentary movies, is a journalist. Can you beleive this dumass!! He’s decussing! I hope the U.S. Tresury gets Millionsss out of him!! He needs to quit making trouble and do a film on personal hygene!! He is NASTY looking!! A haircut, shave, and a bath would help! And if he liked Cuba so much why don’t we just send him back!!!!!!!!!!!!!! Noticed in your pic here, that Moore has put the loser sign with his hand. Yep Moore is a loser. This is freaking capitalism. If the guy has to pull a few stunts to make some money, good for him. As far as the goverment telling me where I can and can’t go…Screw you and crew the goverment. I am a freaking Amercian and I will go anywhere I damm please, make any money I feel like making by any means neccesary. THAT is the american way.